The technique of applying pressure on particular parts of your body is called “Acupressure”. Acupuncture is similar to Acupressure but it uses needles. Acupressure is an ancient healing method that uses nothing more but the pressure of your hands. It nurtures both the body and the spirit. It’s a part of Traditional Chinese Medicine or TCM for over 2,500 years! There is a really powerful point on the human body acupressure refers to as CV 17! This point is an incredible emotional balancer. It’s four finger widths up from the base of your breastbone, in the center of your chest. Using acupressure on this point is of a tremendous help for: PTSD, chronic fatigue, depression, hormonal imbalances, substance abuse, suicidal thoughts, anxiety attacks, trauma, fear, recovering from a injury or surgery and Fibromyalgia. Put a gentle pressure on the area between your eyebrows with the soft front of your thumb and hold for 45 seconds. Then, gently applying pressure all the way, begin to push upward till you almost pass the midpoint of your forehead and repeat. Continue this massage for another minute. This massage is said to relieve headaches and anxiety, but is even more effective as you transition to a more relaxed state through breathing and sinking deeper into the relaxation. During this time, you can close your eyes and focus on your breathing. 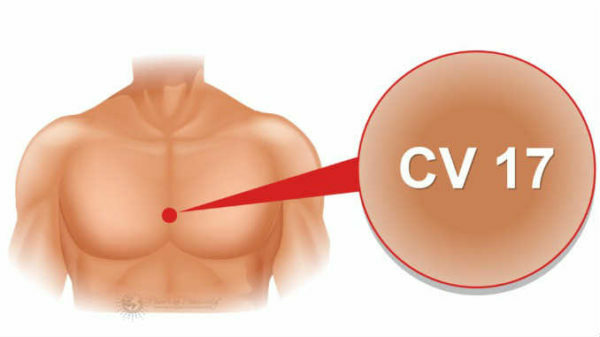 To aid with this you might also apply pressure to “CV 17”, between your chest plates at the center, as pressure at this point is said to boost your mood as well as encourage you to take deeper breathes as your chest should not rise as you breathe, but your stomach and sides should; kind of like how a dog breathes when he is resting on his belly.